Dill Bouquet is a popular variety in America. It is an early bloomer that sports large seedheads and dark blue-green foliage. With good flavour it is the best cultivar for seed production. Sweet and aromatic, the flavour is intermediate between anise and caraway. 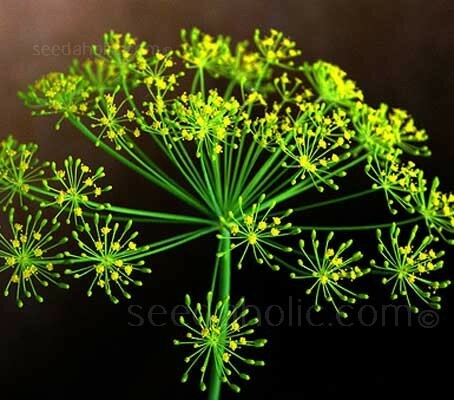 The fruits (“dill seeds”) which impart a sharper flavour, are used as a spice, while the fernlike herb leaves (“dill weed or baby dill”), especially when fresh, have a sweeter fragrance. Dill is certainly delectable. If ever the term "best if home-grown" were to apply to an item in the kitchen, dill would be it! 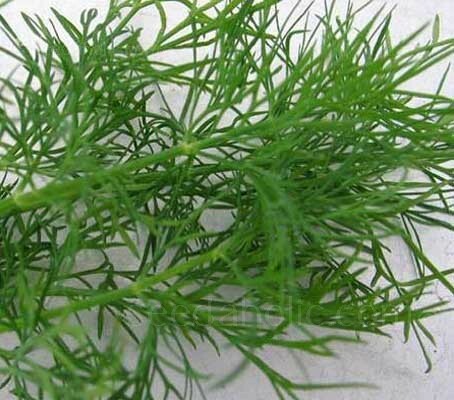 Dill enhances the flavours of a dish as well as compliments other herbs when combined. It is exceptional with vegetables, fish and mustard based dressings or sauces, lamb, potato and peas. The seeds and herb are also a flavourful addition to breads and other baked goods and for those on a salt free diet, the seed makes an excellent stand-in for salt – it is a complete culinary treasure! Dill is easy to germinate and cultivate, it causes few problems for novice gardeners. It is a very attractive plant, whether container grown or in a garden bed. Dill is especially suited to container growing, either indoors or outdoors. 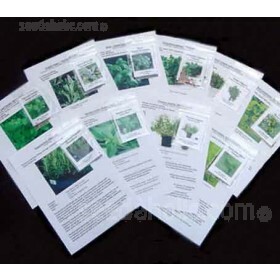 Sow seed in clumps in 7cm (3in) pots. Use moist seed compost, cover with a fine layer of compost and keep the pots well watered. Transplant into larger pots when 15cm (6in) tall - No later as the plant's long taproot resists transplanting. If keeping indoors, place the plants in a sunny position but out of direct sunlight and away from radiators. Support with a stake. Prepare the soil by digging to a spade and a half depth. The long tap roots of dill need to be able to grow without hitting solid soil. Incorporate some long lasting fertiliser, such as bonemeal, at the rate of two handfuls per square metre (yard). Sow thinly in April, covering with only a fine layer of soil. The seedlings will emerge in two weeks or so, and should be thinned to 24cm (9in) apart. Further sowings can be made during the spring and early summer to extend the harvest time. Keep the plants weed free. The long tapered roots of dill will ensure that it is unlikely to need watering in all but the most extreme dry conditions. Pinch the leaves down to the base of the plant until the plants are about 12cm (5in) high. As it grows snip the fronds at the point where they are emerging from the stalk. Remember to add dill at the end of cooking, because cooking will destroy most of its flavour. Be sparing with seeds - or it may overwhelm other flavours. Dill leaves will keep well in the fridge for about three weeks, and stored in the freezer in individual portions. Seeds can be used whole or crushed in a mill or coffee grinder. The dried seeds keep indefinitely when kept out of sunlight in an airtight container. Dill improves growth and health of cabbage and is a best friend for lettuce. Good Companions: Cabbage, Lettuce, Onions, Sweetcorn and Cucumbers. Dill does attract the tomato horn worm so it would be wise to plant it somewhere away from your tomato plants. Plants intended for seed for planting should not be grown near fennel as the two species can hybridise. 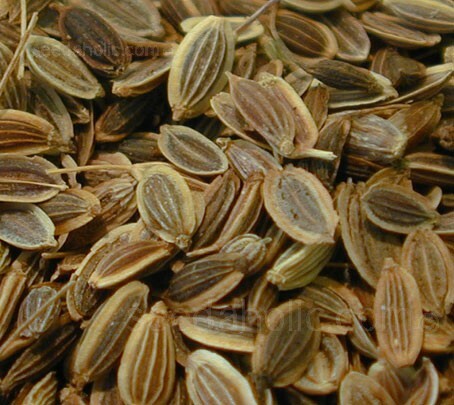 Dill seeds contain carvone as an essential oil. Dill is considered carminative, stomachic and slightly stimulant. Correctly stored, seeds are viable for 3 to 10 years.